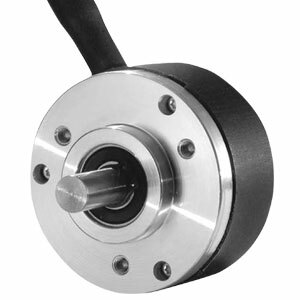 The ZSD Series encoder is ideal for applications requiring a miniature, high precision, low cost encoder, designed with all metal construction for years of troublefree operation. The outputs are standard quadrature with index, available in 100 or 1000 pulses per shaft revolution. The ZSD sensors have open collector outputs. An open collector output brings the uncommitted collector of the encoder switching device to the external world. Because the collector element is not associated with the sensor supply voltage, the sensor output collector may be “pulled up” to external voltages (30 Vdc maximum) different than the encoder supply voltage. NPN open collector outputs are current sinking devices. An output signal will not be generated unless a pull-up resistor is connected from the open-collector to the positive side of an external supply. The same supply can be used for powering the unit and for the pull-up resistor. Flexible shaft coupling, 25 mm (1") long, 0.250 to 0.250"
Flexible shaft coupling, 25 mm (1") long, 0.250 to 0.375"